How to move data from Free- to Pro-Version? Is the mileage logbook accepted by public authorities? TripTracker provides complete and correct data collection but in the end it depends on you and if the data you entered is reliable and comprehensive. Has my car an OBDII interface? All light duty vehicles sold in North America since 1996, as well as medium duty vehicles beginning in 2005, and heavy duty vehicles beginning in 2010, are required to support OBD-II diagnostics, using a standardized data link connector, for state mandated emissions inspections. Why is OBDII Adapter not working? TripTracker needs to know which car uses which adapter. Therefore you have to assign it to a car. Click here to see how this can be done. Unfortunately it is impossible to get the absolute odometer value with OBDII but fortunately it can be calculated from another parameter. Therefore you have to enter your cars current mileage once. Please uninstall all other OBDII Apps since they may block the connection to the adapter. What is the difference between the Free- and the Pro-Version? I only need to take a monthly fee for Sync-Plugin in Pro-Version since I also have to pay the rented servers monthly. Why are that many permissions required? TripTracker is a quite functional app and needs therefore some permissions. All of them are explained here. 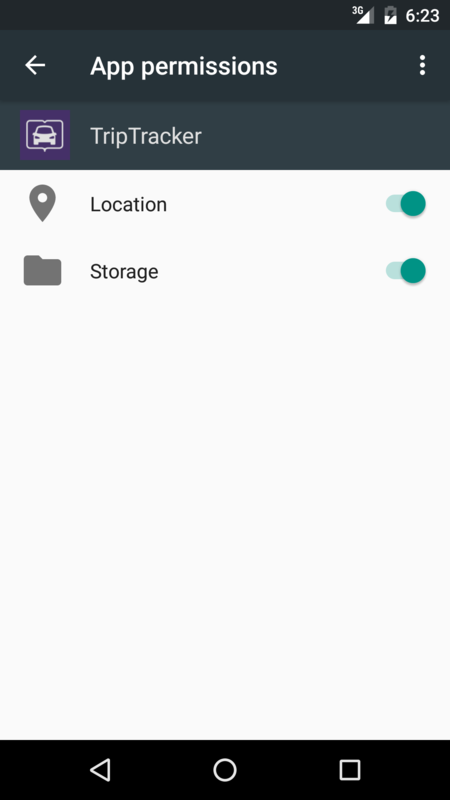 Since Android 6.0 you need to explicitly confirm that the App is allowed to read/write to your file system. If you don't allow that the App will not be able to create your documents or backups and may not work properly. Please give TripTracker its required permissions by enabling them in the screenshot you can see here. Can you send me some demo files from the export? To see how the exported documents look like just click here. How to setup the sync? First of all you need to buy the Sync-Plugin. This fee is required since I also have to pay the server costs monthly. It is also not included for free in PRO Version! Then you have to register an account on www.aTripTracker.com (on the upper right corner). Battery saving feature of Android 6 or Android 7 are preventing TripTracker from tracking your way. Change battery saving settings to normal, and be sure to add TripTracker as a "protected app". Turn Energy Settings to Normal and add TripTracker to "Protected Apps"
Do you have any questions, requests or suggestions? Please feel free to contact us. We appreciate your message and will answer it as soon as possible.